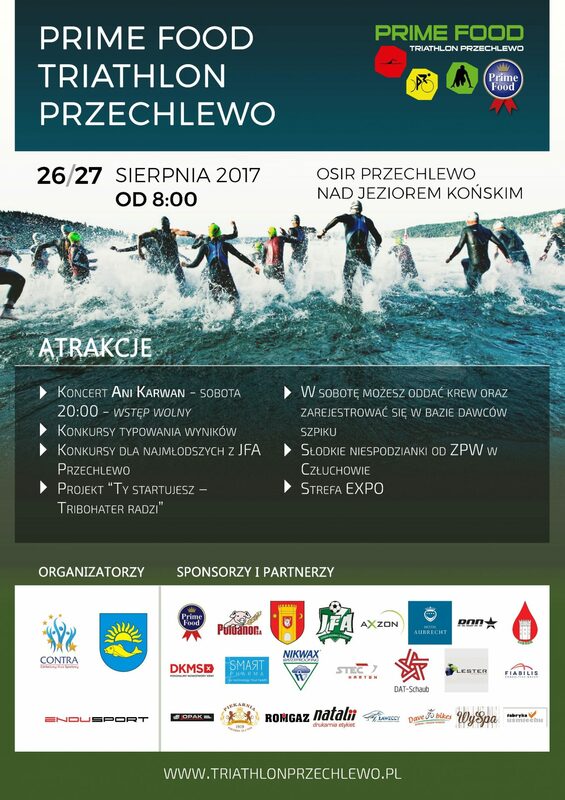 Sports Competition involving more than 900 Triathletes with great passion to compete (including Kacper Adam, Piotr Ławicki), non Sporting Events as well as additional attractions await all arriving Końskie Lake on 26-27 August 2017. It will be held here for our jubilee, the fifth edition of Przechlewo Prime Food Triathlon – Triathlon holidays and fun with a unique atmosphere created by the participants, supporters and volunteers. The Triathletes and passionate competitors of this sport will be able to swim, cycling and run on three individual distances: 112.99 km (“half”), 56.5 km (“quarters”), 28.5 km (“sprint”) and one team (56.5 km). The event will also feature the Tri Tour Cycling Club Championships featuring the best national teams this season. Amongst others we have attending, we have many triathlon clubs (including about 48 from Przechlewo, about 12 from Człuchów, about 17 from Chojnice , about 4 from Kartuzy), competitors from Tricity (about 73), Koszalin (about 22), Słupsk (about 22), as well as other parts of Poland (eg Poznań, Zielona Góra, Katowice). – The triathlon and fun holiday will officially start on Saturday morning, but the triathlon “town” will start to appear on Lake Końskie a few days earlier. Gradually it will be filled with great triathlon teams and supporters until the weekend finale. It is worth going to Przechlewa to see for yourself how the area will change and catch for yourself the triathlon bug thanks to the warm atmosphere created by competitors, volunteers, locals and other triathlons – said Paweł Nowak, President of Prime Food and one of organizers. This year’s novelty will be the project “You are racing – We can advise!”. Throughout the duration of Prime Food Triathlon, participants will be able to get pre-starting tips from experienced competitors. The organizers encourage everyone to spontaneously support the participants of the Prime Food Triathlon Strike 2017 (fighting for Tribloaters) as well as participating in numerous non-sports attractions. On Saturday night (at 20 o’clock) Ania Karwan will perform on the main stage – finalist of the 7th edition of “The Voice of Poland”, also known as Uli in the series “Color of happiness”. Free entrance. At the weekend there will also be competitions with prizes (banner, cheering and competition for volunteers). All triathlon fans will also be waiting for the: EXPO and gastro zone (with surprises from the team of care and education centers of the Człuchowski District and partners of the event), Blood donation campaign and registration of potential bone marrow donors (organized by Człuchowski Association of Blood Donors and DKMS Foundation). Something for children, The Junior Football Academy will invite them to the Mini Triathlon – a fun game combining fitness, artistic and educational competitions. The Clown Shufudlarz and Żuk Emil (Zumby show host) will also take care of the good moods of the youngest. – I am convinced that anyone who visits our area next weekend will find something for themselves. The jubilee edition will be the pinnacle of over five years of the work of the organization and the anticipation of what we are planning for next seasons. I invite you to support and compete together in the outdoors! I believe that our joint commitment will translate into excellent results and unforgettable memories for the participants, as well as enormous support for those in need – added Paweł Nowak, President of Prime Food, one of the organizers and a triathlete – he will be competing as he does every year. Start and finish Przechlewo Prime Food Triathlon 2017 will be located in the Sports and Recreation Center in Przechlewo. The arena for swimming and entertainments will be located at lake Końskie and cycle route and running routes take place in the picturesque surroundings.